Heath and Safety requirements currently legislate that any appliance which is powered by 'Mains Voltage' has to be PAT tested annually. PAT testing means that the appliance has to be tested for electrical safety, and in the event of an electrical fault, the user is not placed in danger. 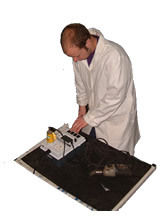 NIS obviously can carry out PAT tests, we actually test and repair the PAT testers that are used!! NIS can incorporate PAT testing for clients in with the asset management program to ensure that field staff have fully tested and certified equipment. Obviously field plant is required daily, so NIS can customise testing programs to test over a weekend. Please contact our technical team for further information.